I have not yet discovered a place where they serve the same variety and quality of Japanese style desserts as Sun with Moon does. This is what makes me go back to this restaurant again and again. I was never impressed by their food selection, so I prefer to patronise this restaurant for sinful afternoon desserts. This branch of the 'Sun dining' chain of restaurants is located on the 3rd floor of Wheelock Place. 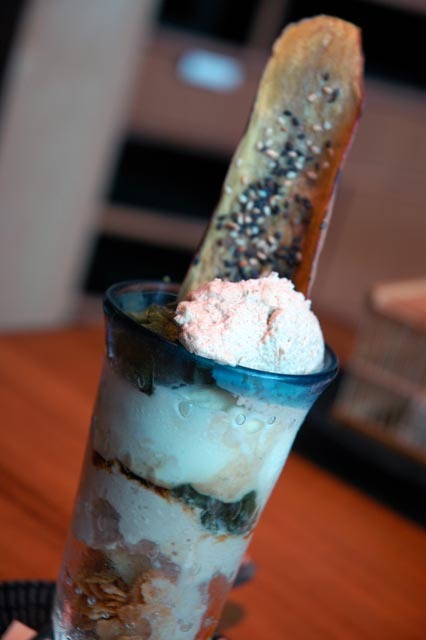 Their Japanese desserts, drinks and cocktails menu has a wider variety compared to the other branches. Their vitamin cocktails are a mix of fruit juices and vitamins. 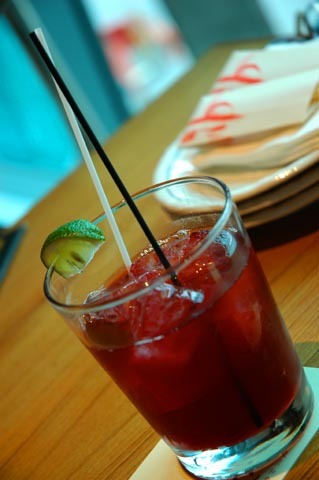 The one pictured is the 'violet vitamin cocktail' ($6.50). I found this a little too sweet for my taste and I don't particularly recommend it. 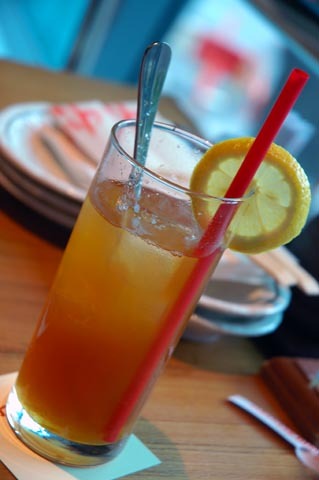 The 'yuzu honey tea' ($6.50) can be requested both hot or cold. Any yuzu lover must order this drink, which comes with real pieces of caramelized yuzu lying at the bottom of the glass. The 'tofu cheesecake' ($5.50) is made from both cheese and tofu. 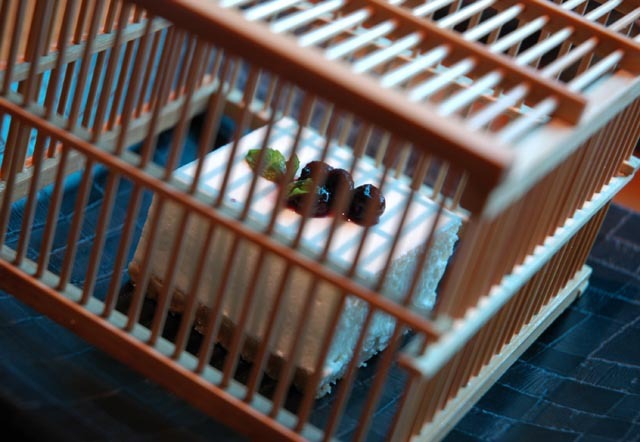 It's served in a bird's cage and it tastes like a regular soft-type cheesecake, with a cream cheese texture. The 'warabi mochi parfait' remains my favourite. I can never find one that's as good as the one I had at a very traditional Kyoto dessert venue, but this is close. Those who like contrasting textures will be amazed as they dig deeper and deeper into this sinful combination of flavours and textures. It starts with a foamy coffee bavaroise accompanied by chewish warabi mochi cubes. The ice cream layer underneath prepares your palate before you can dive into a concert of warabi mochi, cubes of chiffon cake and crunchy cereals, topped by another lump of coffee bavaroise. It's hard to describe the emotion that can be generated by crunchiness, sponginess, creaminess, cold and warm all combined together into this ultimate dessert, while maintaining a balanced flavour. Unfortunately I only had the chance to review these two desserts, although every dessert served at 'Sun with moon' would deserve its space on this page. If you like desserts you will enjoy this place. If you have a passion for Japanese desserts, you definitely can't miss it.